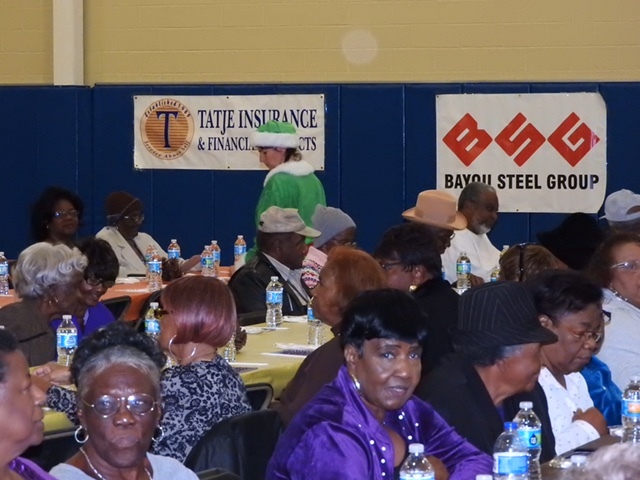 A great time was had by all who attended the SJSO’s annual Thanksgiving luncheon for senior citizens. Sheriff Mike Tregre hosted the annual luncheon yesterday at Regala Park gym in Reserve. Seniors enjoyed bingo, and many won great prizes. A delicious lunch of baked chicken, rice dressing, green beans and bread pudding was served. More than 100 door prizes donated by local businesses were presented. Yvonne Alexander won the grand prize, a 48-inch TV donated by Walmart. Winners of breakfast with the sheriff were Loraine Williams and Elizabeth Davis. Santa, McGruff the Crime Dog and Darren the DARE Lion enjoyed visiting with the seniors. The SJSO is grateful to the sponsors who helped finance the event. Sponsors were Pin Oak Terminals, Ingram Barge, LaPlace Lions Club, Marathon Petroleum, Rotary Club of LaPlace, Tatje Insurance and Financial Products, Bayou Steel, Smoothie King, Walmart, Brock’s Automotive, Clement’s Wrecker Service, Cypress Gold, Home Depot, Supreme Ford of LaPlace, Pete’s Wrecker Service, Poker Palace, Rainbow Chevrolet, Riverlands Surveying Co. and Tyrone’s Wrecker Service. Sheriff Tregre also is grateful to the many rock artists who painted Thanksgiving-themed rocks for the seniors. Thanks to the rock artists, each senior left the luncheon with a beautifully-painted rock. File of Life cards also were presented to seniors. The luncheon was a great way to start off the Thanksgiving holiday. Happy Thanksgiving to all!